Funded by the Scottish Government, the Farm Advisory Service (FAS) exists to help new farmers and crofters grow their business through a range of business development support and one-to-one advisory services. As a new farmer or crofter you are entitled to access a range of subsidised expert business support –worth up to a total of £2,200–to help you increase the profitability and sustainability of your new business. FAS can also arrange for an experienced farm adviser to visit your business, perform a critical assessment and offer you expert advice on a range of farming-related topics, tailored to your specific business needs. For more information, please contact advice@fas.scot, call 0300 323 0161 or visit the FAS website. 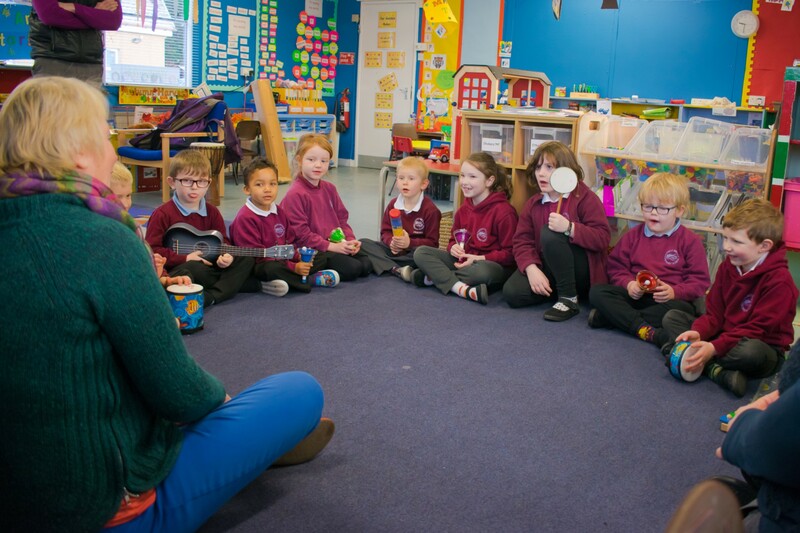 We are pleased to announce our latest grant awards including: funding groundworks preparation for the twelve new supported homes in Drumnadrochit, purchase of a new grounds maintenance vehicle for Glen Urquhart Shinty Club and a community music & heritage project involving Cannich Bridge, Glenurquhart and Balnain Primary Schools co-ordinated by Fèis Rois. 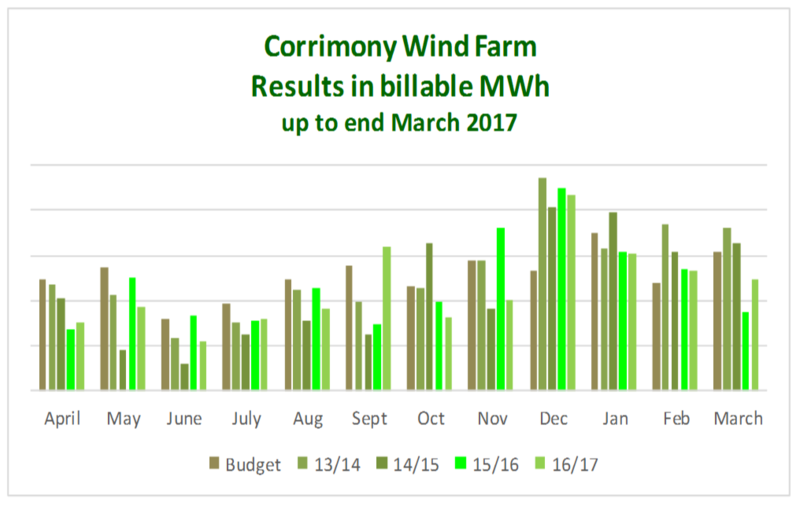 Soirbheas was established to strengthen and support the communities of Glen Urquhart and Strathglass, through revenues from local renewable energy schemes. The funds received from these schemes are distributed to local community projects in the form of grants and community development projects to help protect the environment and to provide and develop more resilient communities. • More internet providers to develop social tariffs that provide a basic broadband service to those on low incomes. • Those working to tackle poverty and inequality to recognise the savings that can be made by being online, and to ensure people can easily apply for social tariffs. To find out more about the SCVO campaign, read the briefing paper here. If your organisation would like to be a named supporter of this campaign, please sign up by emailing digital@scvo.org.uk . Soirbheas has helped to arrange some free Money Matters sessions which are being delivered by Age Scotland on Tuesday 21st November in Drumnadrochit. After the sessions you will have access to confidential follow up support from an Age Concern adviser. Through Community Assets the Big Lottery are focused on helping local communities to address specific inequalities or disadvantages through ownership of an asset. Applicants will need to show a clear evidence that they have consulted with their communities, considered various options to meet their needs and selected the best option to address this. Big Lottery also want to fund work that is people-led, strengths-based and connected. Further information about understanding these ‘three approaches’ is available, including case studies. Talking with applicants earlier in the process can lead to stronger applications. Because of this, there is no application form. The first step is to talk to us about your idea so we can give you advice on whether or not this funding is right for what you want to do. If we think your idea potentially fits with Community Assets we will then normally arrange to visit you. The Elderly and Young Partnership for Glen Urquhart and Strathglass are planning to host some Money Matter sessions in November organised by Age Scotland and funded by the Money Advice Service. After the session people can call Age Scotland for a confidential conversation with an adviser – 0800 1244 222. Drumnadrochit has been chosen as one of four communities to take part in the COBEN project. 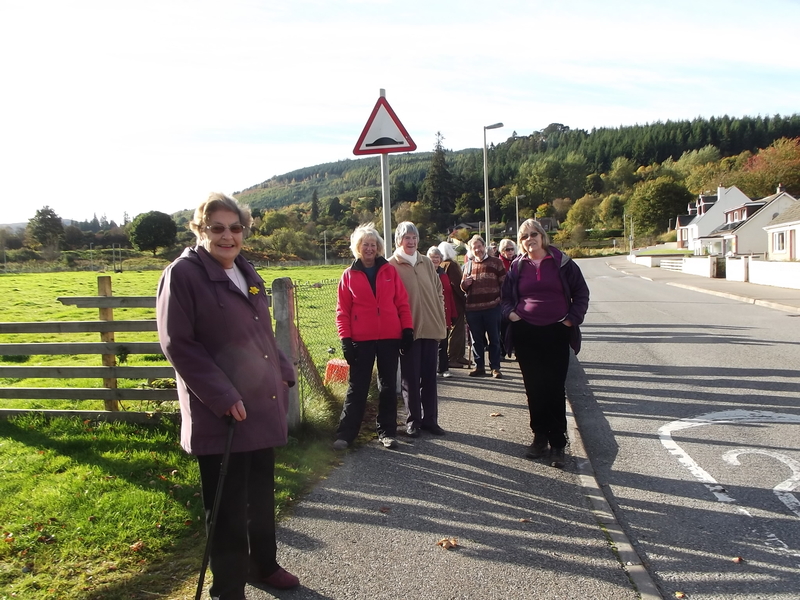 Soirbheas, the community charity for Glen Urquhart and Strathglass responded to the call for communities to take part in the project, putting forward Drumnadrochit as a community keen to address its local energy needs. The Community Benefits of Civic Energy (COBEN) project aims to evolve support for community energy to move from a focus of electricity generation supported by subsidies, to a more ‘whole system’ approach where communities’ energy generation, energy efficiency, heat, storage and future usage needs are all considered together. Four areas in the Highlands and Islands Enterprise region have been chosen to take part in the pilot COBEN project to develop local energy plans. The selected areas are – Brae (Shetland Islands), Drumnadrochit, Barra and Vatersay (Western Isles) and Oban. These communities have been selected to reflect the range in sizes, locations, attributes and challenges that communities have across the Highlands and Islands. The four local energy plans will set out key priorities and opportunities and make recommendations and suggest practical projects for each community. Work in each area starts in October and local energy plans will be completed by mid-2018. Selected recommendations supported by the project will be implemented by October 2019. Community Shares – The term ‘community shares’ refers to withdrawable share capital; a form of share capital unique to co-operative and community benefit society legislation. This type of share capital can only be issued by co-operative societies, community benefit societies and charitable community benefit societies. Since 2009, almost a 100,000 people have invested over £100m to support 350 community businesses throughout the UK. You can watch a short animation to understand why more and more people are investing in community shares to support community enterprises. The Life Changes Trust welcomes applications from organisations and individuals in Scotland with experience of dementia who are seeking funding to produce resources that equip and encourage people suffering with dementia and their carers can apply for grants of between £500 and £7,000. The awards will support people living with dementia and their carers in Scotland to share knowledge and helpful information with each other by creating peer to peer support resources, such as leaflets, DVDs, videos, etc. Eligible projects/resources must have long term value/relevance (at least three years). Resources must be practical and truly reflect the experiences and needs of people living with dementia and/or carers. The resources created through the fund will also provide a valuable source of education and information for people who want to know more about dementia, such as hospital or care home staff, relatives or friends. The deadlines for applications are 1 September 2017 and 2 February 2018. 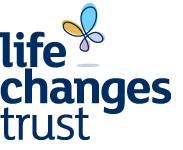 Further information is available from the Life Changes Trust’s website. The Scottish Government’s Voluntary Sector Development Fund has opened for 2017/18 applications with a funding pot of £900,000 for voluntary sector organisations providing social services in Scotland. The Scottish Service Council has taken over managing this fund at the request of the Scottish Government. Voluntary organisations registered with the Care Inspectorate can apply for funding to contribute to costs associated with achieving SVQ Social Services and Healthcare at SCQF Level 6 qualifications. A total of £900,000 is available for the 2017/18 round, with successful applicants receiving up to £25,000 each. • Support Workers in Housing Support Services. • Support Workers in Care at Home Services. Funding is available to support the cost of SVQ Social Services and Healthcare at SCQF Level 6 qualifications. Transport Scotland and Energy Saving Trust are seeking expressions of interest for a second funding call for the Low Carbon Travel and Transport Challenge Fund. The second call will launch in early October and public, community, and third sector organisations can apply for funding under the European Regional Development Fund 2014-2020 Programme, to facilitate the delivery of active travel and low carbon transport hubs. Awards will be announced in March/April 2018. Organisations will be able to bid for up to 40% (Lowlands and Uplands) or up to 70% (Highlands and Islands) of their total eligible project costs, where total eligible project costs can be between £250,000 and £2 million. The 70% ERDF intervention rate for H&I is subject to European Commission approval. The remainder of the project costs must be provided through match funding identified by the applicant from other non-European public sources. Projects funded through this second call must be completed by December 2019. Read more about the LCTT Challenge Fund and find an expression of interest form. 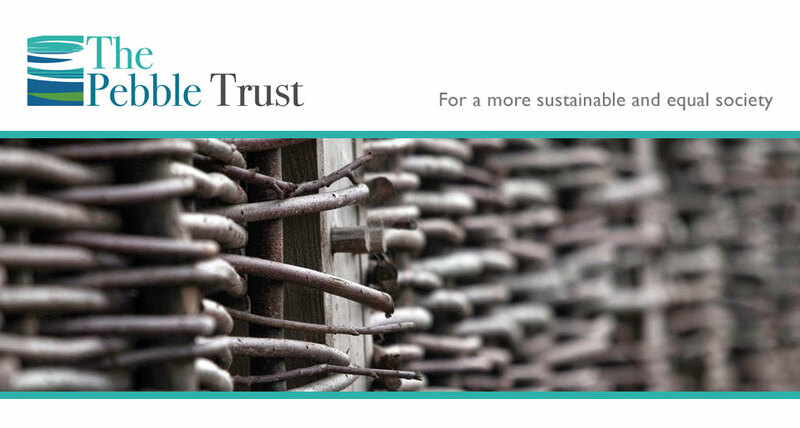 The Pebble Trust – Has a vision of a more sustainable, equal and low-carbon society, where constraints on fossil fuels lead to a more localised economy with stronger, more resilient, communities, and where human activities take account of climate change and the wider environment. The Trust supports projects in Scotland, and particularly in the Highlands and Islands. Applications will be prioritised from the Highlands and Islands and grants will be restricted to a maximum of £5,000. Nature is the Best Classroom at New Outdoor Nursery A unique new outdoor nursery is opening in Glen Strathfarrar. Children will spend the majority of every day outdoors exploring, playing and learning. They will help around the croft, follow the seasons, and spend time squelching in the bog. Summerlings Outdoor Nursery will allow children to play safely and freely in a beautiful environment with lots of opportunities for their development. Experienced staff have the skills and experience to turn the landscape into an excellent outdoor classroom for children at the nursery. Summerlings Outdoor Nursery is opening as part of The Shieling Project. The nursery will cater for 3-5 year olds. The Shieling Project and Summerlings Outdoor Nursery are based in Struy, Inverness-shire. The Nursery will be opening October 25th 2017 term time, Wednesdays, Thursdays and Fridays, sessions will run 9am-3pm. Enrolment is currently taking place, parents can opt to send their child to the new nursery for up to three days as part of their childcare entitlement. Soirbheas, the community charity for Glen Urquhart and Strathglass will part fund a place for an apprentice to be part of the Summerlings staff team. Vacancies also exist for a qualified Early Learning & Childcare Practitioner. For more information regarding Summerlings Outdoor Nursery or The Shieling Project including volunteering and job opportunities see the website, www.theshielingproject.org and/or find The Shieling Project on Twitter, Instagram & Facebook. SQA has developed a suite of Digital Learning Guides. The guides help people who don’t have the digital skills and confidence to carry out every day online activities. The guides are free to use. There is no log-in or registration required. Learners simply click on the guide of choice and work through it following the step-by-step visual and audio instructions. The wide range of learning guides are designed in short segments, a demo followed by an interactive section. This way learners build skills and confidence by undertaking hands-on activity. They are particularly useful as support for volunteers, carers and other community workers who encourage people to explore and develop their digital skills. Are you a business owner in rural Scotland? Complete this survey on rural Britain’s digital potential. SRUC (Scotland’s Rural College) is working with Rural England on a new project which is seeking to find ways to help ‘unlock’ the digital potential of rural Britain. As part of the project, a consultation has been launched aimed at rural business owners across the UK. The project is seeking to maximise the potential of the internet and technology to boost the digital economy of rural areas, and has been commissioned by Amazon. Rural business owners with businesses of all sizes, ages, structures and sectors from across the country can respond to the consultation. Responses will be analysed alongside official statistics, interviews with key rural and digital stakeholder groups, and economic analysis. Recent research from the SME Growth Tracker, a quarterly report by Capital Economics commissioned by Amazon UK and Enterprise Nation, suggests that there is significant potential for the rural economy by going digital in terms of business and employment growth and this project will help to understand the best ways that this can be achieved. Rural businesses can submit their views to the consultation on the Rural England website until the beginning of September. The project report will be published by the end of this year. For more information on the project, please contact Jane Atterton in the first instance at jane.atterton@sruc.ac.uk. The SCVO Digital Participation Charter Fund, supported by the Scottish Government, the ERDF and BT, invests in community digital participation projects across Scotland. The projects that they’re supporting will enable groups and organisations to digitise content, build digital networks and improve the digital skills of their members, so that they can continue to thrive in the digital world. Projects must meet some broad criteria to be considered for funding. Provide regular progress updates by posting content to your project page. Other terms and conditions will also apply. The closing date is 5pm 31 August 2017. Awards for All grant programmes is a partnership between the Big Lottery Fund Scotland, sportscotland and Creative Scotland provides grants to local voluntary and community organisations, schools and statutory bodies for projects and activities which matter to people and communities. • Bring people together and build strong relationships in and across communities. • Improve the places and spaces that matter to communities. We’ll give preference to projects run by small, local organisations. You can’t use money from the fund solely to pay for staff salaries or general running costs, or to make a donation to another organisation. You can save your application at any time and return to it later. To apply or to find out what funds are available in your area – see link . Applications must be completed by 8 August 2017. This information has been compiled to inform you of the options available to you if your home or business has not benefitted from the recent rollout of superfast broadband. You can check what broadband services are already available to you by using the GoSuperfast or https://checker.ofcom.org.uk/ or ADSL availability checker. Satellite broadband – Rather than use using copper/fibre, satellite broadband operates by sending and receiving your broadband signal to a satellite about 22,000 miles in space. Even isolated properties or properties on “Exchange Only” lines should be able to access a Satellite Broadband service. What’s more, satellite broadband in the UK is now much cheaper and faster than it used to be and doesn’t require a huge outlay for a satellite dish and installation. If you receive less than 2 Mbps download speed via your phone line then you may be eligible for a Better Broadband voucher to subsidise the cost of installing satellite broadband (see end of this sheet for more information). 4G is the fourth generation of mobile phone technology and follows on from 2G and 3G. 4G services make it much quicker to surf the web on your mobile, tablets and laptops. Because of this, 4G is ideally suited for services which demand more capacity like video streaming, mapping and social networking sites. You can check what 4G coverage is like for different networks in your area at this website: http://maps.ofcom.org.uk/check-coverage/. It can be a more expensive way of accessing the internet but if you don’t download or stream that much and live in an area with a decent 4G signal then this could be a quick and easy way to improve your connectivity. The Better Broadband Scheme – The Government has made a commitment to provide every home and business in the UK with access to a basic broadband service so that browsing the web and keeping in touch with families and friends is easier. A subsidised broadband installation is now available if you cannot access an affordable broadband service with a speed of at least 2 Mb per second. This can reduce the total cost of installation by up to £350. In order to encourage inclusive growth and greater public – private partnership working at a local level, grant funding is available for business groups and local bodies, working in partnership with their local authority, to develop proposals for Business Improvement Districts across Scotland. The grant funding is to support the development of town and city neighbourhoods, tourism and visitor areas, rural areas, business and industrial parks, food and drink and single business sector BIDs such as textile or whisky. The grant of up to £20,000 is a single payment. Funding for the development of Business Improvement Districts may be limited and whilst all applications will be considered, it is inevitable that some will not proceed to grant or may fail to meet the assessment criteria. These dates allow for a ballot to take place in September, October and November the following year. These dates allow for a ballot to take place in February, March, April, May or June in the following year. Applications for grant which propose a ballot date outside of the above months as a result of local conditions or sector requirements may be considered separately. The BIDs Project Director should be contacted prior to submission of the grant application. Please download the ‘General Criteria and Guidance Letter‘ and the ‘Application Form‘, which give further details on the application process and requirements in respect of the seedcorn grant. On the 19th November 2008 Mr. John Swinney MSP, Cabinet Secretary for Finance and Sustainable Growth announced, as an aspect of encouraging economic growth, improved support for Business Improvement Districts in Scotland (BIDS) with an increase in the grant available to business groups and associations, working in partnership with their local authority, to develop proposals for Business Improvement Districts across Scotland. Community Food and Health (Scotland) has launched the 2017 round of its Annual Development Fund. Community Food and Health (CFHS) offers funding to groups and organisations working with or within Scotland’s low-income communities to improve access to, and take-up of, a healthy, varied and balanced diet. Annual Development grants of between £500 and £2,000 are available to groups and agencies that can develop, recruit for, and complete food and health activities by the end of September 2018. • Developing or improving an existing activity. • Extending the range or scale of a food related activity that the applicant already does – such as offering the activity in a new area or with a different type of group. • Helping to develop the applicant’s activities to sustain them in the long term – such as training staff or volunteers (or both) to provide food-related activities or buying new equipment that the applicant will use well into the future. • A pilot or feasibility study. CFHS prefers to fund community groups, voluntary organisations or social enterprises; but will consider applications from agencies such as the NHS, schools or other local authority organisations if they work closely with community groups. The deadline for applications is 4 August 2017 (5pm). Climate Challenge Fund now open! CCF grants of up to £150,000 per organisation, per year, are available for projects taking place between 1 April 2018 and 31 March 2020. Funding available in 2018/19 will also include a contribution from the European Regional Development Fund. The CCF is a Scottish Government grants programme managed and administered by environmental charity Keep Scotland Beautiful. The CCF provides funding and support for community groups to tackle climate change through community-led projects that reduce carbon emissions. To date, the CCF has awarded grants totalling £85.8 million – supporting a range of successful projects, including energy efficiency improvements to community-owned buildings, home energy efficiency advice, lower carbon travel options and community growing initiatives, plus schemes that help reduce waste and move Scotland further towards a more circular economy. Climate Challenge Fund Development Grants of up to £1,500 are also available to help community-led organisations identify and scope out potential climate action projects – with the aim of enabling the organisation to apply for a CCF grant or to another funder. The deadline to submit an Expression of Interest, the first stage of the application process for a CCF Grant, is 5pm on 28 August 2017. Applications for Development Grants are invited monthly until further notice. Potential applicants are encouraged to visit the CCF website for further information on the CCF and how to apply. Postcode Community Trust will re-open for applications to its grants programme on the 1st August 2017. Through its grants programme, the Trust will provide grants of £500 – £20,000 (£10,000 in Wales) for projects that benefit communities through grass-roots sports, arts and recreation programmes and healthy living initiatives that improve a community’s physical and mental health. Funding is available to registered charities, voluntary organisations, community interest companies and social enterprises. Please note that only registered charities can apply for grants above £2,000. Previous projects supported include Adel Pre-School in Leeds which received a grant of £20,000 to construct an outdoor play area with specific focus on sensory elements; and Blantyre Soccer Academy which received a grant of £13,070 to purchase new training equipment and other items allowing them to expand their youth outreach programmes. The closing date for submitting Expressions will be the 18th August 2017. Following the gathering facilitated by Highland Seniors Citizens Network and Age Scotland in Inverness last October, we held similar events in Wick, Ullapool, Fort William and Aviemore. Older people’s groups have enjoyed the opportunity to come together and look at common issues, share information about their groups and about local services. 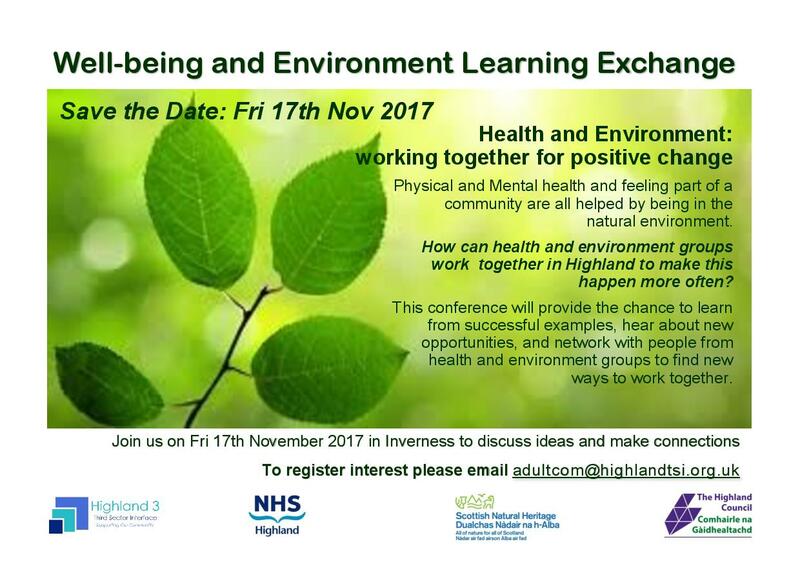 There was interest in all areas for these meetings to be held regularly, so we are now letting you know about the 2nd Inverness event. At the October meeting, people talked about the value of sharing information, the challenges of finding out information, and how good it is to hear about what others have been doing. The theme for this meeting is, therefore, Keeping informed. We are meeting at the Merkinch Community Centre, Coronation Park, Inverness, IV3 8AD on Wednesday 28th June 2017, 10.30 – 2.30pm. Tea/coffee will be available on arrival from 10am and soup and sandwiches served at 12.30pm. Spaces are limited to 2/3 delegates per group. Kindly donated by Mairi Hedderwick, this bursary will support one place on the Moniack Mhor Travel Writing Course from Monday 18th until Saturday 23rd September 2017. The tutors for the course are Horatio Clare and Michelle Jana Chan with guest Sara Wheeler. It is hoped that this opportunity will support those wanting to develop skills in the genre and enhance their writing practice. Applications for this award are now open. The bursary is open to unpublished/published writers living and working in Scotland who have, or would like to have, a travel piece in development. • An A4 summary of your writing project that outlines your work in progress. Applications can be submitted from the 23th March with a closing date of Monday 12th June 2017 at 5pm. The successful applicant will be notified soon afterwards. You can find some advice on the dos and don’ts of submitting on this LINK. All land and property in Scotland is due to move to the modern, digital Land Register of Scotland by 2024. In a guest blog, Scott Bond from Registers of Scotland outlines the work being done to complete the land register, and discusses the benefits of voluntary registration. The British Farming Awards are open for nominations in 14 categories. These annual awards celebrate the creative thinking, innovation and dedication of Britain’s farmers. The awards aim to showcase innovation and adaptability – no matter the size and scale of the business. So if you know an outstanding Scottish farm, farmer or agricultural student why not nominate them for an award? The closing date for entries and nominations is 14 July 2017. Visit the British Farming Awards website for more information. Scottish Rural Action are pleased to announce their membership of the recently formed National Rural Mental Health Forum and welcome the focus on mental health in rural communities during Mental Health Awareness week. The Forum was set-up as part of Scottish Government’s new ten-year Mental Health Strategy announced by Scotland’s Minister for Mental Health, Maureen Watt, in March 2017. Details of the Mental Health Strategy can be found by clicking here. Paths for All are encouraging all walking for health projects and groups to think about holding a Big Fit Walk in June. You can choose any day and it can be instead of one of your regular health walks. Big Fit Walks can be a good way to recruit new walkers and volunteers if you are able to do some local promotion. And the great thing about MyParkScotland is that you’re able to Gift Aid your donation and this ‘extra funding’ will go towards building an endowment fund for Scotland parks and greenspaces– helping to safeguard our national treasures for future generations. This session will help groups increase their chance of running a successful crowdfund campaign. The session will start with a short overview of the crowdfunding concept and then focus on developing crowdfund campaigns for individual groups. • Publishing Plan – helping groups to plan how to publish and promote their crowdfund to achieve maximum results. Bringing together a number of groups involved in projects relating to paths and walking projects will allow for peer learning to supplement the crowdfunding support and coaching being offered by MyParkScotland. The annual campaign, established in 1984, recognises the contribution volunteers make to our communities every day. Thousands of charities and voluntary organisations are gearing up to celebrate the vital contribution made by volunteers across the length and breadth of Scotland. As well as providing the glue which binds neighbourhoods together, volunteering provides the “golden thread” that runs through all Scottish Government’s policy areas. Volunteers’ Week takes place between 1-7 June. In 2017-18 CJS will create 700 jobs for vulnerable young people in eligible third sector organisations across Scotland. Have a look at our information for potential employers. Find out if you are eligible to apply to host a CJS job and what support you can expect. The first stage of the application process is to complete an online Employer Registration form. When your initial registration has been processed, you will be sent login details for stage two of the application. Full details on how to complete stage two will be provided with your login. Due to high demand you may not receive your log-in details for 1-2 weeks after completing the Employer Registration form. When you do receive your log-in, stage two of the application needs to be completed ASAP. If you have any questions please call Francis Harkin on 0141 559 5026. The M&S Community Energy Fund is back. Big, bold and brilliant – and ready to deliver £300,000 to community projects across the UK in £12,000 chunks to switch on bright ideas for renewable energy initiatives. Today’s economic climate is forcing Social Enterprises to become less grant dependent and more self-reliant. This introductory workshop is ideal for those responsible for generating income on a day-to-day basis or those who must now adapt to the “new economy”. The workshop will cover the fundamentals of selling, from preparation to questioning styles, objection handling, and how to develop a consultative approach to sales. This workshop is aimed at those Enterprising Third Sector organisations that are developing new markets or are trying to sell products and services into existing markets. Whether in Retail, the Arts, or business start-up, we provide the foundations for successful conversion. Attendees may include: Staff or Volunteers: Those charged with active or occasional selling at a local level and who may benefit from a more methodical understanding of the process of selling and Decision Makers: More senior staff required to take a more active approach to secure funding or sell Enterprise services. Click here to complete the on-line registration form. We have just 3 delegate places available which will be allocated on a first come, first served basis so please book by return to guarantee your place. Come and visit us, see our beautiful site, meet our staff and get involved in some fun activities. During the event you will hear from some of the teachers who have been working with us, meet our very cute new piglets and calf, and of course eat lots of good food. You can get a feel for the project by taking part in different activities including cooking in our hand made bread oven, and turf wall building. Hot drinks and lunch will be provided. The event will be held in the shelter of our new buildings, but it would be advisable to wear warm and waterproof clothing. There will be an opportunity to walk around the site, so walking boots or wellies to keep your feet dry would be a good idea. Paths for All are offering grants of up to £1,500 to help community groups improve, maintain and promote their local community paths. If the answer is “yes” then we can help you. Download our grant guidance to find out everything you need to know about our Community Path grant including eligibility, the application process and our support in the guidance notes. To get the application process started simply fill in our online Expression of Interest form and tell us about your project. Expression of Interest forms will be assessed by our team and we will inform you whether or not your project is suitable for our Community Paths Grant scheme. The closing date for Expression of Interest forms is 5pm on 19 May 2017. If your project is successful we will send you a link to our online application form to complete and submit. Please contact us if you require a downloadable or hard copy of the Expression of Interest form. If you have any questions simply get in touch with us. We have a dedicated team who can give you advice and support throughout all the stages of your project, contact us on: communitypaths@pathsforall.org.uk or 01259 218 888. Have a look at our inspirational stories from previous applicants. Paths for All annual Big Fit Walk campaign aims to inspire communities across Scotland to come together for a short 30-minute walk on any date in June to celebrate the benefits of being active. Anyone can organise a Big Fit Walk (including Health Walk groups, community groups, workplaces and schools) and we provide free resources which you can order online now at http://www.pathsforall.org.uk/bigfitwalk There’s more info about the Big Fit Walk on the webpage and the resources will soon be available on the page as downloads. 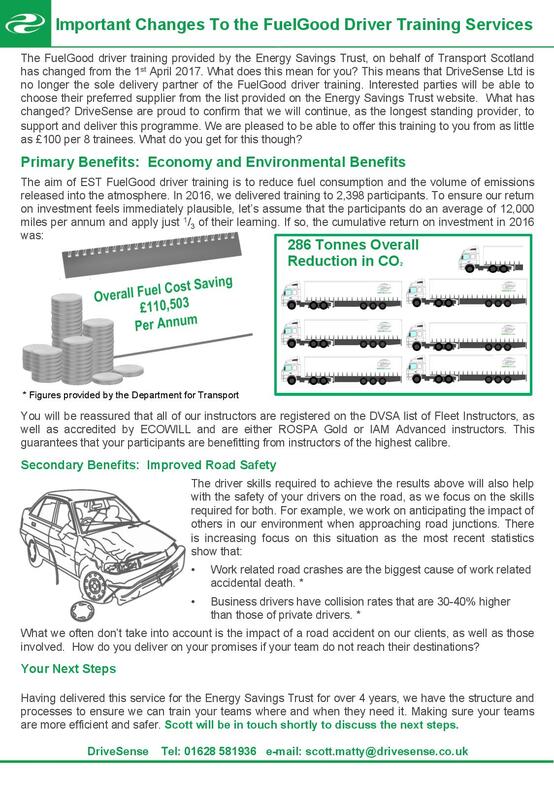 The Energy Saving Trust is pleased to advise that Transport Scotland has confirmed it will subsidise FuelGood driver training for the financial year starting on 1st April 2017. Under this new FuelGood model, training will be provided to Scotland based fleet drivers within the private, public and third sector, as well as community groups and individuals covering internal combustion engine (ICE) or electric (EVs) passenger cars and light commercial vehicles (LCVs). Fuel efficient driver training promotes the adoption of driving techniques that save money, reduce carbon emissions and improve sustainability and awareness. Under the new programme, a number of FuelGood suppliers – approved by the Energy Saving Trust – will provide training to Scotland based fleet drivers within the private, public and third sector; as well as community groups and individuals. Please find all programme details and changes in the attached document. If you have any queries, please contact Energy Saving Trust at FuelGood@est.org.uk or visit our website. FuelGood driver training is delivered by Energy Saving Trust approved driver training companies and independent fleet trainers. Soirbheas announces the launch of new an Apprenticeship Grant Scheme; with the goal of encouraging economic and business growth in the local area with assistance from SSE. The Scheme is open to employers/businesses based in the Soirbheas area (Glen Urquhart and Strathglass, to support them in covering the salary cost of employing a Modern Apprentice (MA). MA’s are now available in over 80 sectors including Childcare, Care Services, Farming, Management, Tourism and Construction industries. “Launching the new Apprenticeship Grant Programme is a real achievement for Soirbheas and a fantastic opportunity to support the local economy and business development.” says Russell Fraser Vice Chair of the Charity. Deadline for first round of application is the 4th May 2017. For more details and application forms please contact Carol Masheter carolmasheter@soirbheas.org. The Step Count Challenge is a team walking challenge. Whether it’s walking to work, holding a walking meeting or a lunchtime stroll, you’ll be walking more and feeling the difference. 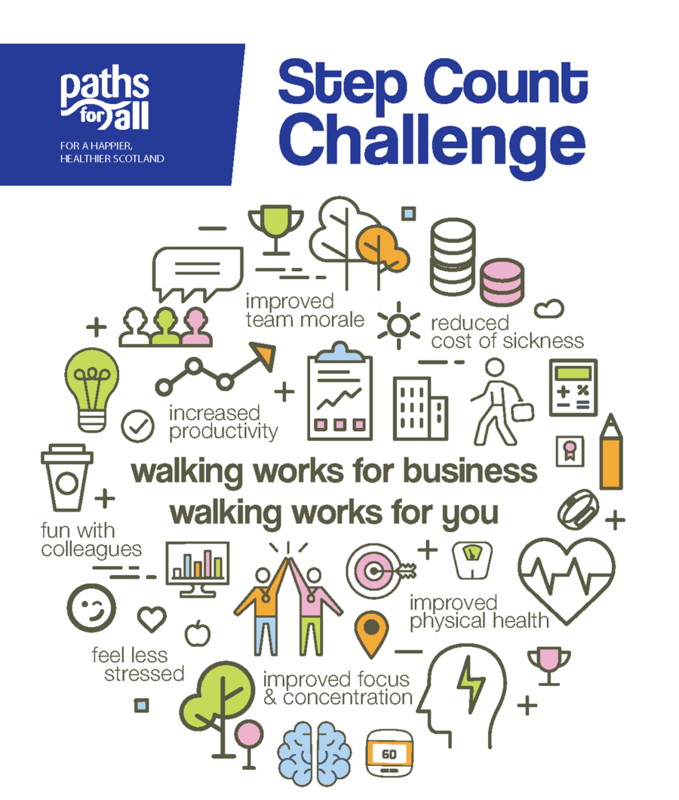 Sign up in teams of 5 workmates and record your steps over 8 weeks. Get to know your colleagues, feel healthier and have fun. It’s a no brainer. Plus, we’ll give you lots of tips, motivation and prizes along the way. Download a leaflet with more information. The first round of the Community Radio Fund in 2017-18 is open for applications from 12 April until 5pm on Wednesday 10 May 2017. The awarding Panel will meet in June 2017 to consider the applications. Priority will be given to licensees that have not been awarded a grant in previous funding rounds and to newly-licensed stations. that focus on posts that promote long-term financial security and may become self-sustaining. Round 1 will accept applications from 12 April 2017 to 10 May 2017 (5pm). Who should Attend? This workshop is aimed at those Enterprising Third Sector organisations that are developing new markets or are trying to sell products and services into existing markets. Whether in Retail, the Arts, or business start-up, we provide the foundations for successful conversion. Attendees may include: Staff or Volunteers: Those charged with active or occasional selling at a local level and who may benefit from a more methodical understanding of the process of selling and Decision Makers: More senior staff required to take a more active approach to secure funding or sell Enterprise services. How to Book: Click here to complete the on-line registration form. Places are limited and are offered on a first come, first served basis so please book early to guarantee your place. 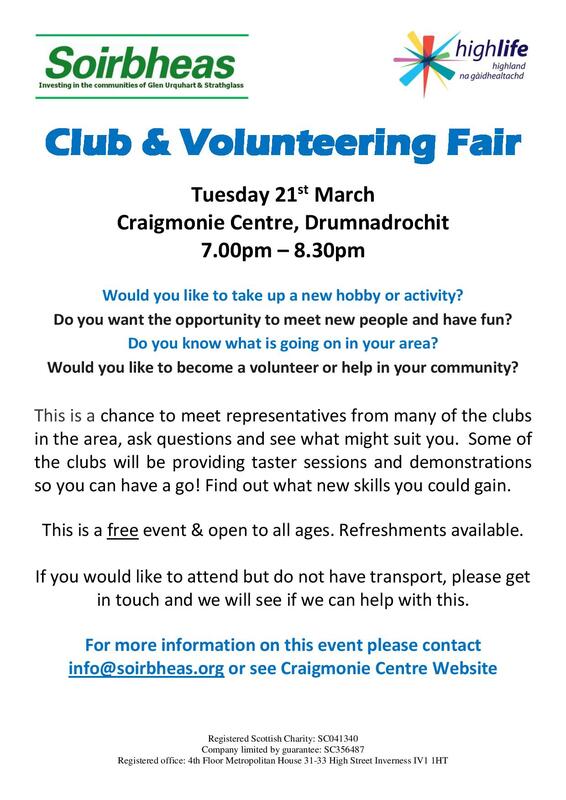 Local charity Soirbheas is keen to get the communities of Strathglass and Glen Urquhart to grow more! 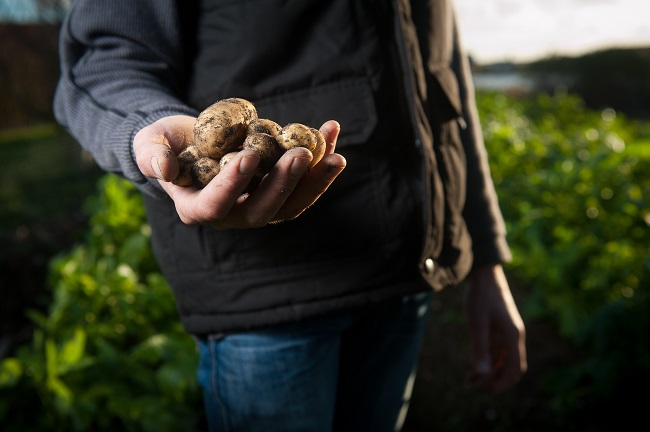 For the last 3 years, Soirbheas has been running a Tattie Project distributes over 2,500 seed potatoes via local schools, nurseries and the care centre to be sold and grown in the community. The aim is to inspire children, their families and the wider community to get growing and eating more tatties. 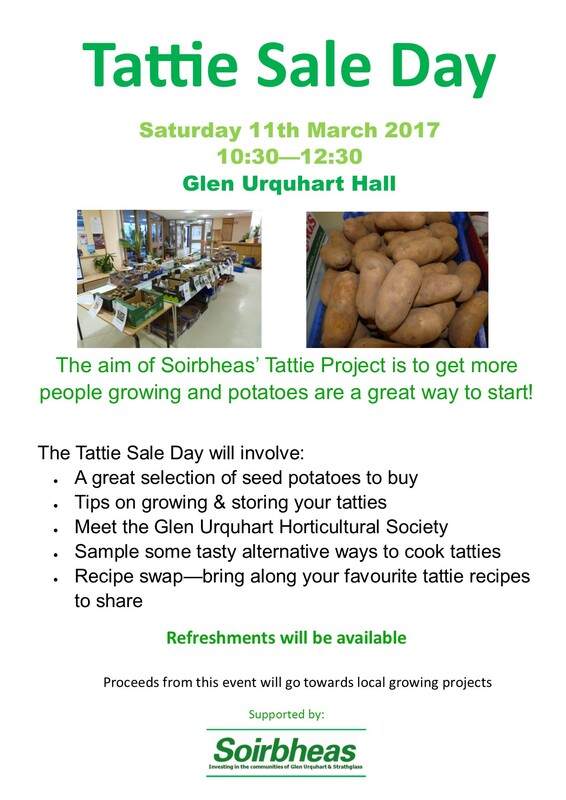 As part of the project Soirbheas is working with the Glen Urquhart Horticultural Society to hold a Tattie Day on Saturday 11th March from 10:30—12:30 in the Glen Urquhart Hall, Drumnadrochit. With over 20 varieties of seed potatoes to choose from on the day, tips on getting the best yields, advice on suitable varieties and how best to store your tatties. For details of all the varieties on offer click here. There will also be an opportunity to sample some tasty ways to user your tatties from chocolate cake to spicy potato fritters. We would love you to bring along your favourite tattie recipes to share with others as part of our Great Tattie Recipe Swap. Whether you are new to growing or an old hand at gardening or just love tatties we are confident that you will find this an inspiring event to attend. Proceeds from the sale of the seed potatoes will towards other community growing projects. Would you like to improve your health? Get outdoors more or meet new people? If YES come and join the Glenurquhart Health Walks! Starting at the car park behind Scotmid, Drumnadrochit every Tuesday at 2 pm. Join us for a 30-45 minute walk, suitable for all abilities. The walk will end with a cup of tea and a chat! We would kindly ask that dogs do not accompany us on the walk. 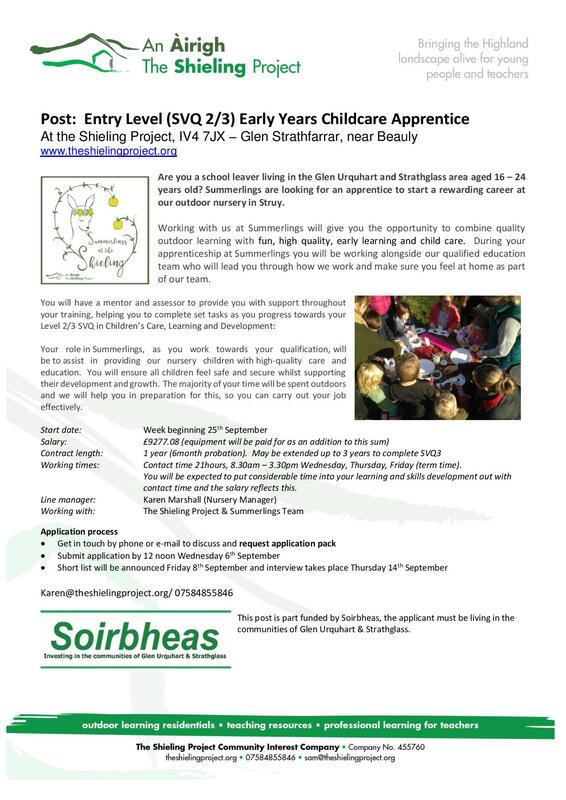 Soirbheas is keen to hear from local business who might be interested in applying for the new apprenticeship grant scheme. The scheme is aimed at supporting local business (from Glen Urquhart of Strathglass) to employ a young person (aged between 16 – 24) to undertake a Modern Apprenticeship. The grant scheme will be launched in March and the charity is currently consulting on the grant guidance and application process with local businesses. The first deadline for application from businesses is 27th April. For further information for on Modern Apprenticeships for young people check out our MA Leaflet. The notion of ‘build it, and they will come’ frequently leaves many Third Sector organisations with a great product or service, and the potential to fulfil a valuable social purpose, but with a distinct shortage of customers or service users. More than just a cost, marketing communication activities are an investment in achieving tangible outcomes for an organisation. In order to achieve these, it has to be viewed as more than putting all the eggs in the one (website) basket, sending innumerable emails rather than lifting the phone to a real person, or placing an annual ad that no-one seems to read. This half-day workshop focuses on marketing communications (promotion) as a key element of the ‘marketing mix’. It explores the fit and contribution of marketing communications to overall business strategy, introduces a generic marketing communication process, describes the key components of a marketing communications strategy, and considers a range of communication tools and techniques available to marketers. The workshop will be a combination of presentation, discussion and small-group activity. Workshop slides will be made available electronically in the week following the workshop. Those who are responsible for marketing and promotional activities, as part of a wider role, but do not have specialist knowledge in this field. Follow @justenterprise for all the latest programme and event news. 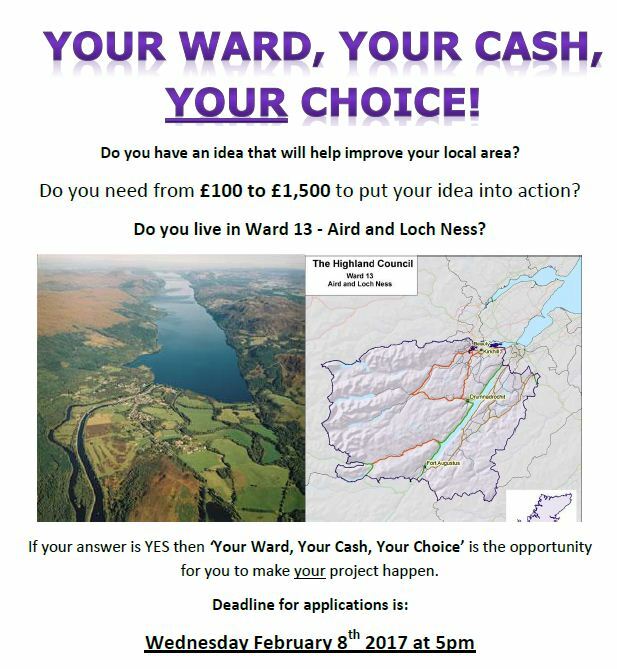 The deadline to apply for Aird and Loch Ness Ward participatory budgeting cash has been extended to 9am Monday 13 February. Community groups in the Aird and Loch Ness Ward are being urged to apply for grants available from £100 up to £1,500 that are available from a £15,000 Ward Discretionary Budget. Participatory budgeting is a process that lets the local community decide for themselves how money is spent and which community projects are needed in their area. The fund is open to any local community, voluntary or non-profit organisations and informal groups that are based in Ward 13. Projects put forward can be large or small, add value to existing projects or be something completely new. Representatives from the projects that meet the eligibility criteria will be asked to present their ideas to members of the public who will then cast their votes during a special event held on Saturday 18 February at the Craigmonie Centre in Drumnadrochit. 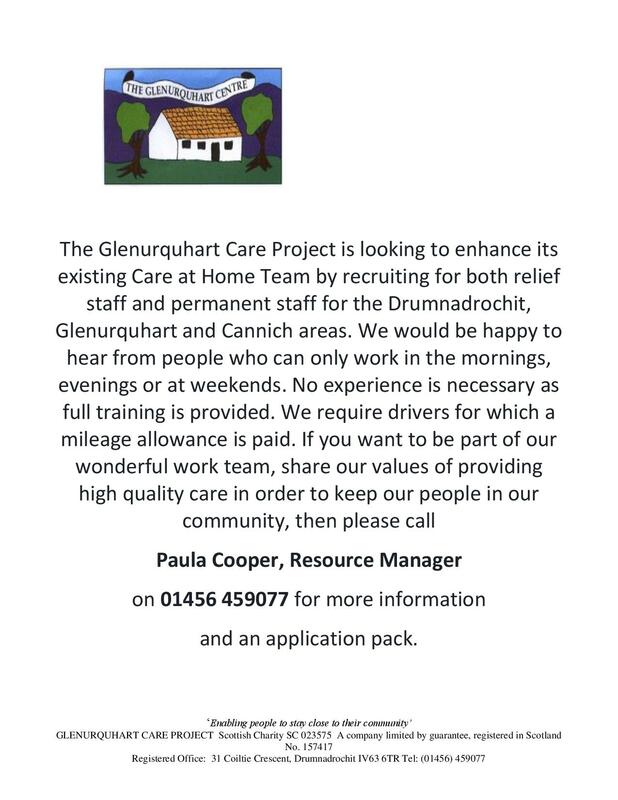 Full details and the application forms are available from the Craigmonie Centre; online at http://www.craigmoniecentre.co.uk/index.asp?pageid=663461 e-mail Craigmoniecc@highlifehighland.com or phone 01456 459224. If you care for a family member, friend or neighbour who could not cope without you, the Glen Urquhart Care Centre has a support group for you. It takes place weekly at the Centre on Thursdays from 10am – 12pm. Bring along £1 for tea, coffee and a scone. You can also stay for a soup and sandwich lunch for £3 if you like. In order to encourage people to take up the serious study of wildlife, Biological Recording in Scotland (BRISC) and Glasgow Natural History Society (GNHS) are offering seven bursaries to anyone living in Scotland to cover some of the costs of attending a suitable training course in 2017. Up to £200 or 75% of the cost of the course, whichever is lowest, is on offer to successful candidates. The closing date for receipt of completed Application Forms is 31st January 2017. The Low Carbon Travel and Transport Challenge Fund is now open – visit the Energy Saving Trust website for more information. Transport Scotland and Energy Saving Trust are hosting a series of events this month and next, to help you develop your application. We will share details of how to register for each event shortly but to allow you to save dates, please see the information below. Please note that both sessions will contain the same content. We will send out details on how to register for these sessions later this week. To participate in the webinar you will need a computer – a headset is recommended. To ensure you get the most out of these sessions, please email LCTT@est.org.uk and let us know what your key questions are likely to be. An email with links to registration for these events will be issued next week.